Its important that the snowmobile track you purchase is appropriate for your snowmobile. If you are unfamiliar with track fitment, you need to make sure you select the correct snowmobile track length, width, lug height and pitch. To assist you with shopping for your replacement snowmobile track, listed below are links to the snowmobile track fitment guides (application charts) for Arctic Cat, Polaris, Skidoo and Yamaha snowmobiles. 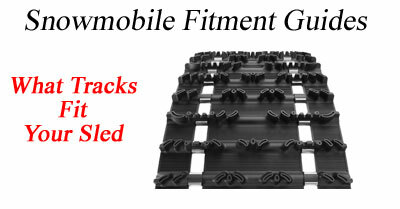 The fitment guide will allow you to search by model of snowmobile. Once you find your sled on the guide, you’ll be provided with the original length, width, lug height and pitch of the track that came on your sled. You’ll also be provided with a link to begin shopping. Remember, if you want us to assist you with picking out the right snowmobile track for your sled, simply call us 607-693-1031 M-F 10am to 4pm EST. For after hours support contact us by email or call us and leave a voice mail and we will call you back.